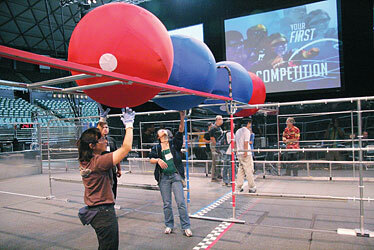 The Hawaii Regional FIRST (For the Inspiration and Recognition of Science and Technology) Robotics Competition is being held this weekend at the Stan Sheriff Center. Teams from 36 high schools -- 24 of them from Hawaii -- will square off in a series of games. 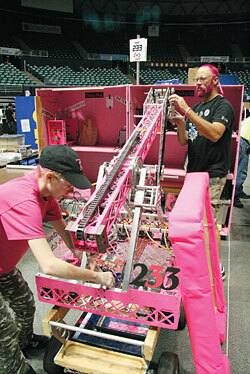 "The Pink Team" from Rockledge High School in Florida donned pink outfits and sported pink hair as they prepared to compete. Shaara Argo, left, worked with Mike D., the team's mechanical mentor. Workers placed huge track balls on an overpass. The robots knock the balls off and then either place the balls back on the tracks or hurl them over. 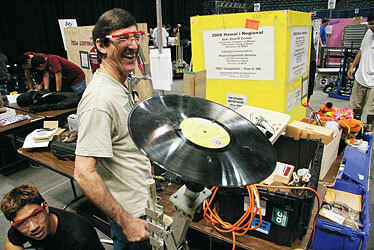 Mike Lowrey, mentor of the team from Hilo High, got a kick out of the competitors' reaction to their robot.